(TORONTO) – The Toyota Matrix continues to deliver exceptional versatility, style and safety with Toyota’s standard Star Safety System. For 2012, the Matrix is available in three models with a choice of engine sizes and drive trains, plus feature-jammed options packages including the all-new Touring Value package, which adds a power moon roof, fog lamps, distinctive 16” aluminum alloy wheels and an overhead console box, plus air conditioning, power windows and door locks, cruise control and more. The 2012 Matrix features an efficient but powerful 132-horsepower, 1.8-litre 4-cylinder engine with Dual Variable Valve Timing with intelligence (Dual VVT-i). For even more impressive performance, the 2012 Matrix XRS and Matrix AWD are fitted with a 158-horsepower, 2.4-litre 4-cylinder engine with Variable Valve Timing with intelligence (VVT-i). Both engines feature sequential multiport electronic fuel injection, and Electronic Throttle Control System with intelligence (ETCS-i) to maximize power while minimizing fuel use, and both achieve a Tier 2 Bin 5 emissions rating. The Matrix and Matrix XRS are standard equipped with a five-speed gearbox. The Matrix may also be ordered with a four-speed automatic electronically controlled transmission, which is standard on the Matrix AWD. The Matrix XRS may be fitted with a five-speed automatic electronically controlled transmission with sequential shift mode and transmission cooler. All transmissions include overdrive. Driving confidence is assured with responsive steering and a smooth ride. Electric power steering is quick and precise at all speeds, while boosting fuel efficiency and reducing maintenance costs. Up front, the Matrix and Matrix AWD feature a MacPherson strut arrangement with stabilizer bar, while the Matrix XRS enhances this with a sport strut tower brace that stiffens the vehicle body for better suspension response and more precise steering control. At the back, the Matrix sports a torsion beam suspension with stabilizer bar, while the Matrix XRS and AWD feature an independent double-wishbone suspension with stabilizer bar for a higher performance experience. The Matrix AWD is sure footed in all weather and road conditions, thanks to its Active Torque on Demand all-wheel-drive system. This functions as a fuel-friendly front wheel drive under normal driving conditions. But during start-up or when the system detects front wheel slip, torque is automatically diverted to the rear wheels in the exact amount required for smooth acceleration and all-wheel traction. The Toyota Matrix is generously equipped with many standard features including: fabric seat coverings; reclining front passenger seat; 16” steel wheels; front and rear splash guards; and intermittent wipers plus an intermittent rear window wiper/washer. The Toyota Matrix may be ordered with the Convenience Package, which adds: air conditioning, power windows with driver’s side auto down function, cruise control, power door locks with keyless entry, rear bumper protector, colour-keyed door handles and a tire pressure monitoring system. The Touring Value Package – new for 2012 – includes all items in the Convenience Package, plus power moon roof, 16” aluminum alloy wheels, fog lamps and an overhead console box. The S Package builds on the Convenience Package and includes: 17” aluminum alloy wheels with wheel locks, an upgraded audio system featuring integrated XM Satellite radio, USB audio input, Bluetooth connectivity and a Vacuum Fluorescent Display and six speakers, a front passenger seat fold-down seatback, power moon roof, roof mounted spoiler, sport front and rear fascia, sport grille, chrome exhaust tip, colour-keyed mirrors, leather wrapped steering wheel and shift knob, scuff plates, fog lamps and an overhead console box. The Toyota Matrix XRS is available in a single, fully equipped edition, featuring all standard items plus: an upgraded audio system featuring integrated XM Satellite radio, USB audio input, Bluetooth connectivity and a Vacuum Fluorescent Display and six speakers; air conditioning; sport fabric seat material; a front passenger seat fold-down seatback; power door locks with keyless entry; cruise control; auto-dimming rear view mirror with integrated compass; power windows with driver’s side auto down function; leather wrapped steering wheel and shift knob; XRS scuff plates; silver-painted inner door handles; overhead sunglass storage; a 115-volt accessory power outlet; anti-theft system; tire pressure monitoring system; 18” aluminum alloy wheels with locks; sport grille; rear bumper protector; power moon roof; colour-keyed mirrors and exterior door handles; chrome exhaust tip; front and rear underbody spoilers; a roof-mounted spoiler; variable intermittent wipers; and fog lamps. The Toyota Matrix AWD features the confidence of on-demand all wheel drive and the standard features common to all models, plus: air conditioning; a front passenger seat fold-down seat back; power door locks with keyless entry; power windows with driver’s side auto-down function; cruise control; silver-painted inner door handles; a tire pressure monitoring system; 16” steel wheels; rear bumper protector; roof rails and crossbars; front and rear splash guards; colour-keyed door handles and variable intermittent wipers. The Toyota Matrix AWD may be ordered with an S Package, which adds: 17” aluminum alloy wheels with locks; an upgraded audio system featuring integrated XM Satellite radio, USB audio input, Bluetooth connectivity and a Vacuum Fluorescent Display and six speakers, power moon roof, roof mounted spoiler, sport front and rear fascia, sport grille, chrome exhaust tip, colour-keyed mirrors, auto-dimming rear view mirror with integrated compass, leather wrapped steering wheel and shift knob, scuff plates, fog lamps and an overhead console box. 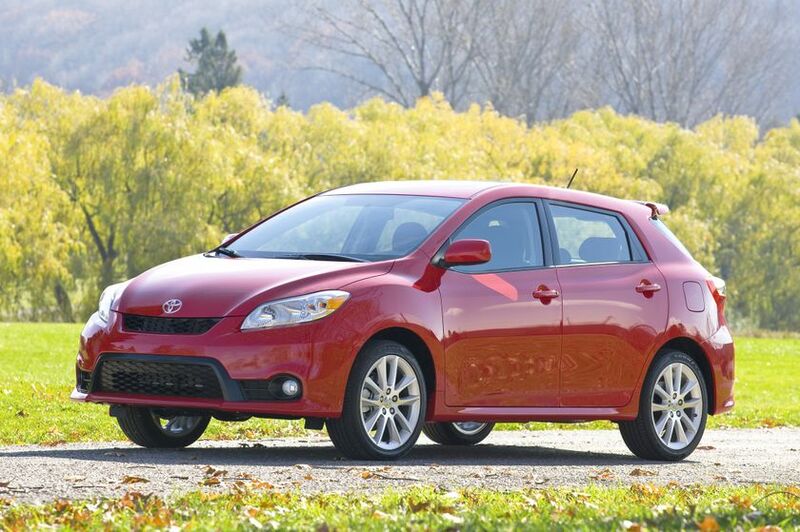 The 2012 Toyota Matrix is now on sale at Canadian Toyota Dealers. The Matrix carries a manufacturer’s suggested retail price starting at $16,795; The suggested starting price for the Matrix AWD is $24,150, while the Matrix XRS carries an MSRP starting at $24,155.